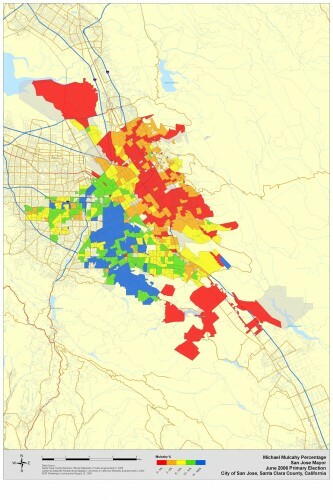 Mulcahy generally did best in west and south San Jose. His base of support paralleled Pandori’s. It was, like Pandori, away from the council districts of the three city councilmembers running. Throughout the five major candidates, the geographic foundations of their bases of their support, either defined by their strengths or their opponents’ weaknesses, were clear. 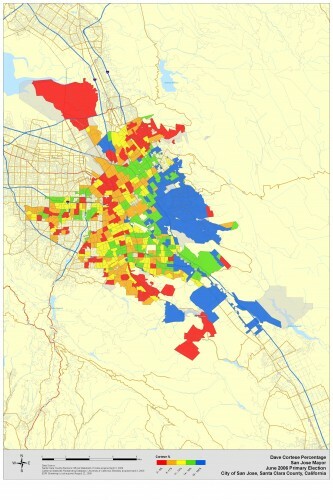 Sources of data: University of California at Berkeley, Institute of Government Affairs, Statewide Database; Santa Clara County Registrar of Voters. Little surprise that the top issue is the economy. And, given we’re interviewing Republicans, again, there’s little surprise the #2 issue is taxes. Adding up the top two issues, a full 2/3s of Republican Primary voters are focusing on money issues and only a quarter a focusing on government service issues. What do feel is the top State of Oregon issue? Survey comprised of 400 live telephone interviews of likely 2010 Oregon Republican Primary voters completed September 14-16, 2009. Likelihood based on a turnout model. Margin of error at the sample median is +/- 5%. This graphic shows two things. First, the sharp increase in Democratic registration percentage during the Great Depression. The Democrats moved from being outnumbered roughly three to one to rough parity between 1930 and 1936. Second, sharp though the Democratic registration increase was during the Great Depression, the Democratic registration percentage never got anywhere near their current advantage. Cortese generally did best in southeast San Jose. His support was centered on District 8, the council district he represented at the time. Like Chavez and Reed, Cortese’s support was centered on his city council district. The 2012 Oregon Republican Presidential Primary is a close affair. Three of the four candidates, Romney, Huckabee, and Palin, are with with margin of error of the lead. All four candidates are in double digits. These four candidates were chosen because they were the only ones consitently on national surveys of Republican Presidential preferences. Survey comprised of telephone interviews of 400 likely 2010 Oregon Republican Primary voters completed September 14-16, 2009. Likelihood based on a turnout model. Margin of error at the sample median is +/- 5%. None of the candidates in the contest are currently clients of Lindholm Company or Lindholm Research. Less than a third of likely 2010 Oregon Republican Primarhy voters have a choice, yet, among the three known Republican candidates. This poll confirms that none of the three Republican nominees currently has any significant statewide name identification. In other words, the nomination is wide open. Tomorrow, the survey results on the 2012 Presidential nomination. The trend in Oregon looks a lot like the national trend: http://lindholmcompanyblog.com/?p=1290. This is the same surge we saw in the national numbers. This graphic shows the numbers of votes for the major party candidates for President. Multnomah County follows the national pattern. The Republican totals for 1920, 1924, 1932, and 1936 were roughly equal. The Republican totals for 1928 and 1940 were roughly equal. Note that LaFollette, the Progressive nominee for President in 1924, actually received more votes in Oregon and in Multnomah County than Cox, the Democratic nominee. However, their combined vote did not match Coolidge’s vote. 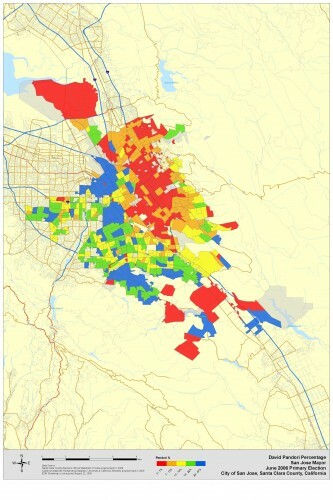 Pandori generally did better in west and south San Jose. Pandori, like Chavez, is a former District 3 city councilmember. However, unlike Chavez, he did better outside his old district. 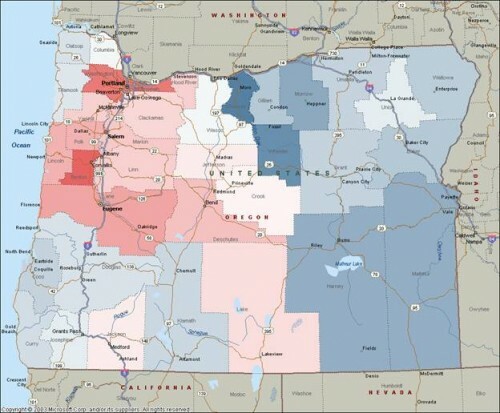 The newly registered voters who voted in the May, 2008 Oregon Democratic Primary were concentrated in the Willamette Valley. Benton, Multnomah, and Washington counties had the highest relative concentrations. This map parallels the long-term partisan registration change (for a map of the changes by House District see: http://lindholmcompanyblog.com/?p=499). This post is part of a series on the 2008 Oregon Democratic Primary. This map represents the relative share of the total number of 2008 Oregon Democratic Primary voters who were New Voters (see below for definition). The map ranges from red to blue. Red is a higher percentage and blue is a lower percentage. Persistent: Long-term Democrats who voted in the 2004 and/or 2006 primary and voted in the 2008 Primary (55% of the total voters). Non-Persistent: Long-term Democrats who voted in neither the 2004 nor the 2006 primary and voted in the 2008 Primary (29% of the total voters). Switchers: Long-term voters who switched from another registration category to vote as Democrats in the 2008 Primary (9% of the total voters). New Voters: Voters who registered after February 1, 2008 and voted in the 2008 Primary (8% of the total voters). Sources of data: Oregon Secretary of State and Labels and Lists. This graphic shows the percentage of two-party vote for the Democratic nominee for President in Multnomah County (Portland) and in Oregon as a whole. It included the three “Great Depression” elections, 1932, 1936, and 1940, where Franklin Delano Roosevelt was the Democratic nominee, and 2008, the most recent Presidential election where Barack Obama was the Democratic nominee. The main point is that Multnomah County’s vote for President closely tracked the rest of Oregon throughout the Great Depression. It was only after World War II that Multnomah County began to be much more strongly Democratic compared to the rest of the state. It is also interesting that Obama’s Democratic percentage in Multnomah County exceeded the percentage Roosevelt received in either of his great landslide wins, 1932 and 1936. This is a good gauge of the magnitude of Multnomah County’s move towards the Democrats.